Staff at the company’s depot in Newcastle have begun carrying out drainage work for the approximately US$168 million project which is expected to give the region a major regeneration boost. The New Wear Bridge which is being built in the north-east of the UK is designed to improve transport links between Sunderland city centre, the Port of Sunderland, the A19 and the wider region. The three-span cable stay bridge, which is due to open in spring 2018, will also open up new development sites at each end, creating opportunities for employment and housing. Drainage and maintenance specialist Lanes Group won a competitive tender to become the sole drainage contractor for the joint venture partners, Farrans Construction and Victor Buyck Steel Construction. Farrans Construction commercial manager Richard Bell says: "We wanted to work with a company based in the region that has the expertise, experience and capacity to support us throughout this high profile development. "Lanes Group secured appointment after a robust procurement process and fully meets our subcontractor selection requirements. We are looking forward to using the company’s experience to help deliver the New Wear Bridge." 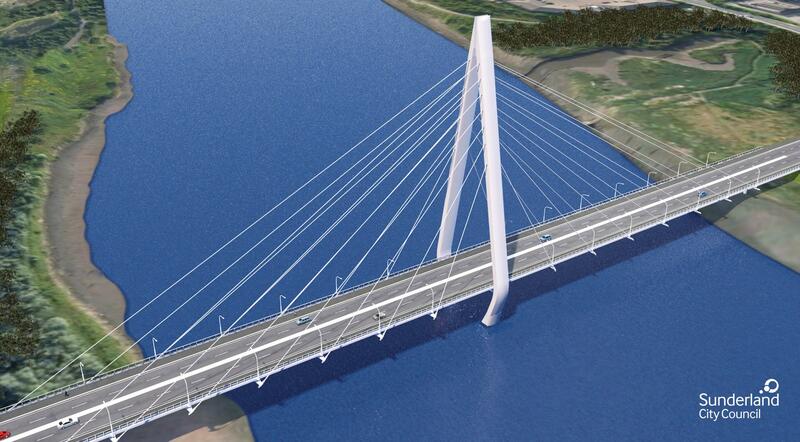 The New Wear Bridge will be 336m long and will have a central A-frame cable tower rising to 105m. This is the second major bridge building project Lanes Group has been contracted to work on in recent months. The company is also providing specialist drainage support for the Mersey Gateway Project, a new bridge across the River Mersey between Runcorn and Widnes.